The establishment of a molecular ecology research program at Southwestern University has provided the opportunity to collaborate with alumni, Dr. Matthew Barnes on an exciting new area of research. The need to understand the complex interactions that occur in our aquatic environments have increased the importance of understanding the “ecology of eDNA,” i.e. the interactions between extra organismal genetic material and the environment (Barnes and Turner 2016). The ability to detect eDNA rests on four principal domains: its origin, state, transport and fate. Current and future work in the lab seeks to: 1) examine the origin of eDNA material from invasive herbivores (specifically Pomacea maculata) and their associated parasites; and 2) explore key environmental interactions and their influence of eDNA accumulation and fate (degradation). Both accumulation and degradation rates of eDNA will likely depend on both temperature and inhibitory factors such as the presence of antimicrobials or antibiotics. Not enough studies have addressed the seasonal influence on eDNA detection. Furthermore, the collective influence of several factors (i.e. invasives, climate change and antimicrobials) on eDNA remains largely understudied (Barnes et al. 2014). SU student "eDNA" researcher Madison Granier with Burks, Dr. David Lodge and Dr. Matthew Barnes at the 2016 Ecological Society of America Meeting. Both Burks & Barnes did their Ph.D. with Lodge at the University of Notre Dame. Barnes & Lodge now help lead the field of eDNA research. 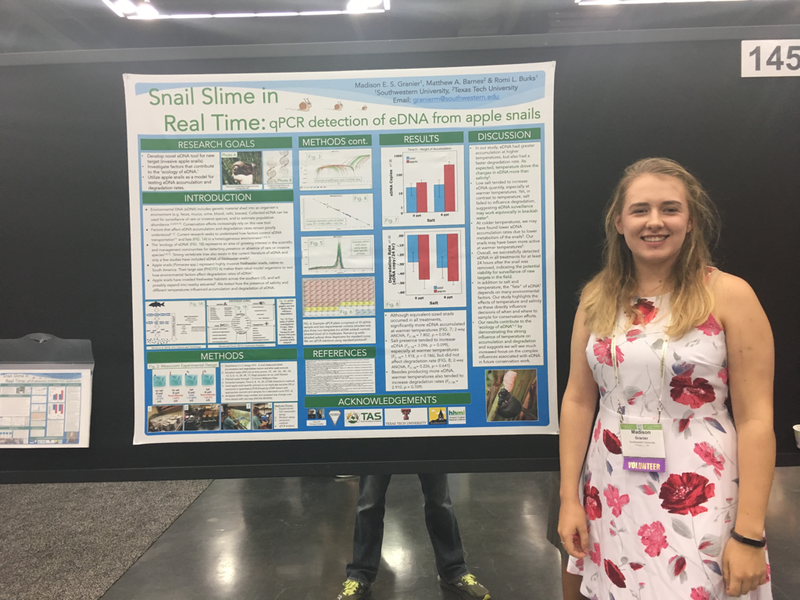 Madison presents her first poster at the Ecological Society of America meeting in Portland, OR.